The Little Red Hen, do you know the story? We were given a copy when Titus was born. 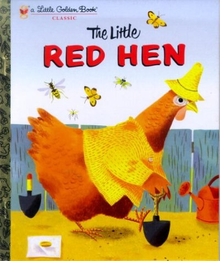 In short (and it is a short book), the little red hen finds a grain of wheat and decides to plant it. She asks for help from a variety of fellow animals, and they all decline to help. They blithely do the same when she asks for help reaping the wheat, hauling it to the mill, and baking bread from the flour. They eagerly offer to help, however, when it comes time to eat the bread. The punch line? The little red hen eats the bread all by herself. And the implied moral of the story is that if you're not willing to help with all the work that goes into a loaf of bread, you shouldn't expect to enjoy the fruits of someone else's labor. As far as it goes, this moral is good. I want my kids to have a good work ethic. But every time I read this story (and Tito seems to pick it out of his book pile fairly frequently), I can't help but think, "I'm sure glad that God hasn't treated me this way." I'm sure glad that God's world doesn't work like the world of children's fables.